The following sites provide more information about Peyronie’s disease and men’s sexual health. As part of our commitment to providing you the most current information and resources, this section will be updated as new resources become available. The Relationship Changer – Victoria holds a Masters Degree in Counseling, is a Licensed Clinical Professional Counselor, (LCPC, IL #180006479), Nationally Certified Counselor, (NCC #90657), Distance Credentialed Counselor, (DCC #1248), and a member of the International Association of Marriage and Family Counselors. More than that she has actual experience with Peyronie’s disease in her own life, so she knows and understands what you and your partner are dealing with. Dr. Angelo Pezzote – Men suffering with Peyronie’s face a psychologically devastating health challenge that’s poorly understood. In addition, “health care” often lacks any “care;” and insurance companies refuse to pay for many treatments. Thus, men with Peyronies can feel very alone. Get competent, caring support from a men’s health and wellness professional who can understand; Visit Dr. Angelo Pezzote at www.doctorangelo.com. Available online, by phone, or in person. Initial contact please email empowerment@doctorangelo.com. This online source for up-to-date news and information concerning issues in sexual health is provided by the Sexual Medicine Society of North America (SMSNA), a nonprofit organization of physicians, researchers, physician assistants and nurses. This nonprofit organization promotes men’s health and wellness through education, screening programs, and advocacy opportunities. Official Foundation of the American Urological Association (AUA). The AUA supports legislation on: A Bill to establish a National Commission on UroTrauma. Dr. Martin K. Gelbard provides informative coverage of topics related to Peyronie’s disease and hosts a question-and-answer forum. The Web MD Erectile Dysfunction Health Center provides current information about a variety of conditions that affect erectile function, including Peyronie’s disease. Read about various health conditions, including Peyronie’s disease. PubMed comprises more than 23 million ciations for biomedical literature from MEDLINE, life science journals, and online books. This patient-support website is dedicated to helping men deal with erectile dysfunction. The Post-Finasteride Syndrome Foundation is dedicated to helping fund research on the characterization, underlying biologic mechanisms and treatments of the post-finasteride syndrome (PFS). A secondary goal is to help increase public awareness of PFS. Often life-altering, PFS is characterized by devastating sexual, neurological, and physical side effects. Provides the daily tools users need to make healthy choices, and live healthier lives. This program’s site provides information about Peyronie’s disease, erectile dysfunction, and other male sexual conditions. The Global Genes Project is one of the leading rare and genetic disease patient advocacy organizations in the world. The non-profit organization is led by Team R.A.R.E. and promotes the needs of the rare and genetic disease community under a unifying symbol of hope – the Blue Denim Genes Ribbon™. What began as a grassroots movement in 2009 with a few rare disease parent advocates and foundations has grown to over 500 global organizations. Prostate Cancer Education and Support Network is a 501-c-3 nonprofit, grassroots organization started in 1990 by prostate cancer survivors for prostate cancer patients, survivors, their spouses/partners and families. NORD is a unique federation of voluntary health organizations dedicated to helping people with rare “orphan” diseases and assisting the organizations that serve them. Learn more about prostatitis, its treatment, and current research. 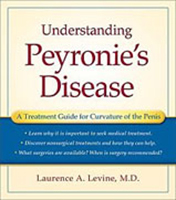 Dr. Levine answers the most commonly asked questions about Peyronie’s disease. Dr. Mulhall describes the causes and symptoms of prostate disease and approaches for dealing with the aftermath of treatment. This patient-friendly brochure presents an overview of Peyronie’s disease and how men and their partners can cope with the condition. In this book, international authorities review current nonsurgical and surgical treatment options for Peyronie’s disease. Various state-of-the-art research techniques are presented.